C-reactive protein (CRP) has been associated with prognosis of HIV-infection, but its relationship with cardiovascular disease remains unknown. We aimed to evaluate whether CRP may be a marker of cardiovascular risk in HIV-infected patients, and to determine the influence of antiretroviral therapy (ART) on CRP levels. We conducted a cross-sectional study on 245 consecutive HIV-infected patients during a 2-month period. An extensive workup for cardiovascular risk was performed, including determination of CRP levels measured by an ultrasensitive immunoturbidimetric assay (detection limit, 0.003mg/dl). Ninety-nine (40.4%) patients had serum CRP concentrations above 0.3mg/dl, considered to represent individuals at high risk for developing cardiovascular complications. In univariate analysis, CRP levels correlated positively with total cholesterol (p=0.01), LDL cholesterol (p=0.001), triglycerides (p=0.04) and Framingham risk score (p=0.006), and negatively with HDL cholesterol (p=0.004). Concentrations of CRP were higher in males (p=0.05) and smokers (p=0.002). No correlation was found between CRP levels and HIV-viral load or CD4 cell counts. In multivariate analysis, independent factors associated with the highest quartile of serum CRP concentrations (0.49mg/dl) were LDL-cholesterol (p<0.001), HDL-cholesterol (p=0.001), cigarette smoking (p=0.019) and current ART (p=0.021). Our results show that C-reactive protein is associated with traditional cardiovascular risk factors, and may then be a marker for cardiovascular risk linked to HIV infection and ART. RATIONALE: Patients with COPD have an ongoing systemic inflammation, which can be assessed by measuring serum C-reactive protein (CRP). OBJECTIVE: To determine whether increased serum CRP in individuals with airway obstruction predict future hospitalization and death from COPD. METHODS: We performed a cohort study with a median of 8-years follow-up of 1,302 individuals with airway obstruction selected from the ongoing Copenhagen City Heart Study. MEASUREMENTS AND MAIN RESULTS: We measured serum CRP at baseline, and recorded COPD admissions and deaths as outcomes. During follow-up, 185 (14%) individuals were hospitalized due to COPD and 83 (6%) died from COPD. Incidences of COPD hospitalization and COPD death were increased in individuals with baseline CRP >3mg/L vs. </=3mg/L (Log-rank:Ps<0.001). After adjusting for gender, age, FEV1% predicted, tobacco consumption, and ischemic heart disease, the hazard ratios for hospitalization and death due to COPD were increased at 1.4 (95% CI: 1.0-2.0) and 2.2 (1.2-3.9) in individuals with baseline CRP >3mg/L vs. </=3mg/L. After close matching for FEV1% predicted and adjusting for potential confounders, baseline CRP was on average increased by 1.2 mg/L (ANOVA: P=0.002) and 4.1 mg/L(P=0.001) in those who were subsequently hospitalized or died from COPD, respectively. The absolute 10-year risks for COPD hospitalization and death in individuals with CRP above 3mg/L amounted to 54% and 57% among those older than 70 years, with a tobacco consumption above 15g/day and FEV1% predicted less than 50%. CONCLUSIONS: CRP is a strong and independent predictor of future COPD outcomes in individuals with airway obstruction. Background Cardiac biomarkers, including high-sensitivity C-reactive protein (hs-CRP), N-terminal proB-type natriuretic peptide (NT-proBNP) and cardiac troponin-I (Tn-I), have been associated with an adverse outcome in patients with acute coronary syndrome (ACS). Thus, in the present study the incremental prognostic value of these cardiac biomarkers was evaluated for risk stratification of ACS. Methods and Results The baseline levels of hs-CRP, NT-proBNP and Tn-I were measured in 215 patients (140 males; 65+/-46 years) with ACS: ST-elevation myocardial infarction (STEMI): 56; non-ST-elevation myocardial infarction (NSTEMI): 98; unstable angina (UA): 61. The patients were retrospectively followed up for a mean of 246 days. There were 24 cardiac events: STEMI: 1, NSTEMI: 6, UA: 6, chronic heart failure: 1, death: 10. The baseline levels of hs-CRP and NT-proBNP were significantly higher in the patients with cardiac events than in those without events. After adjustment for major clinical prognostic factors, hs-CRP and NT-proBNP remained significantly independent predictors for cardiac events. Patients with hs-CRP level >3.5 mg/L and NT-proBNP level >500 pg/ml had an 11-fold higher risk for cardiac events than those with hs-CRP level </=3.5 mg/L and NT-proBNP level </=500 pg/ml. Conclusion The combination of both cardiac markers has an incremental value in the risk stratification of patients with ACS. Plasma adiponectin (Panel A) and CRP concentrations (Panel B) in smokers (n=30) and nonsmokers (n=30) Individual (non-transformed) data for each subject are shown with IR smokers (¡ñ), IS smokers (o), IR nonsmokers (), and IS nonsmokers (Δ) identified. Adiponectin and CRP values were log-transformed for statistical analysis. The horizontal lines represent the geometric means of the IR (©¤) and IS (---) subgroups within the main groups of smokers and nonsmokers. a P value indicates the significance of the effect of smoking on adiponectin (Panel A) and CRP (Panel B) concentrations after controlling for differences in insulin resistance status by two-factor ANOVA; b P value indicates the significance of the effect of insulin resistance on adiponectin (Panel A) and CRP (Panel B) concentrations after adjustment for differences in smoking status by two-factor ANOVA. The following data are geometric means, and their 95% confidence intervals in parentheses. The adiponectin concentrations were 7.0 μg/ml (4.9-10.1) in IR smokers, 10.6 μg/ml (8.2-13.7) in IS smokers, 8.6 μg/ml (6.3-11.7) in IR nonsmokers, and 15.9 μg/ml (11.2-22.6) IS nonsmokers. Whereas, the CRP concentrations were 1.90 μg/ml (1.16-3.10) in IR smokers, 1.37 μg/ml (1.01-1.84) in S smokers, 1.43 μg/ml (0.80-2.56) in IR nonsmokers, and 0.99 μg/ml (0.59-1.65) in IS nonsmokers. 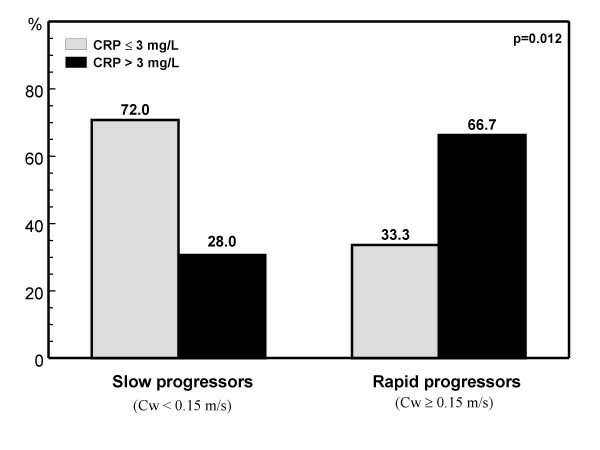 Rate of CRP > 3 mg/L in patients with slow and rapid aortic stenosis progression according to the assesment of aortic jet velocity (Cw). Slow and rapid progressors were considered those patients with an increase in aortic jet velocity < or ≥ 0.15 m/s respectively, during the six months follow-up. 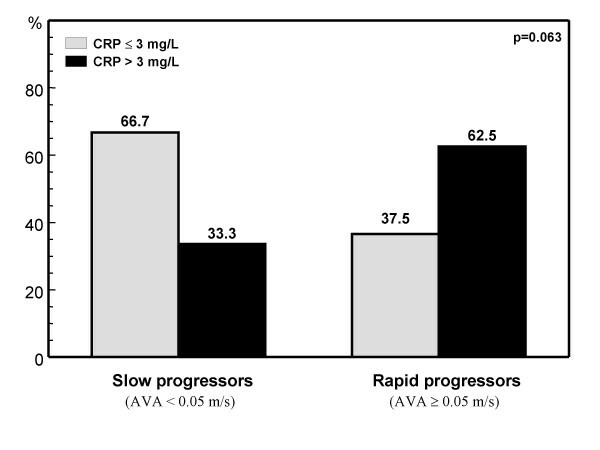 Rate of CRP > 3 mg/L in patients with slow and rapid aortic stenosis progression according to the assesment of the aortic valve area (AVA). Slow and rapid progressors were considered those patients with a decrease in AVA < or ≥ 0.05 cm2 respectively, during the six months follow-up. Pedro L Sanchez and Anna Maria Mazzone. Cardiovasc Ultrasound. 2006; 4: 37.